South Llano River State Park is a bird watcher’s paradise. As you drive along the entrance road into the park you will pass the first of many bird viewing blinds that are scattered throughout the park. All of the bird blinds are well maintained and equipped with comfortable seating, a log book where you may record the birds you have observed and a bird identification book as well as bird posters on the inside walls. Outside, birds flock to the various feeders and bird baths. The observation glass offers a crystal clear view of our feathered friends comings and goings. 220 species of birds are found in the park. 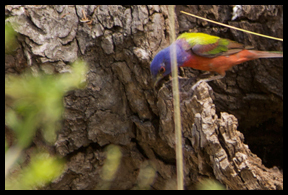 The Painted Bunting, a native Texan, makes it’s summer home here at the South Llano River State Park. This beautiful, colorful songbird retreats to Mexico in the winter months however returns to the South Llano River State Park each spring. The rare and endangered Golden-cheeked Warbler establishes breeding territories at the South Llano River Park in early spring.Another rare and endangered bird, the Black-capped Vireo is also found at the South Llano River State Park. At present the Black-capped Vireo breeds in only a few isolated areas of Oklahoma, Central Texas, and Coahuilla. The old-growth Juniper-oak woodlands at the South Llano River State Park also attract hummingbirds. They hunt the many small insects in the riverside (riparian) areas of the spring-fed South Llano River. The South Llano River State Park is at the eastern edge of the range of the black-chinned hummingbird and at the western edge of the ruby-throated hummingbird’s range. When you come out to camp at the South Llano River State Park hang a hummingbird feeder at your site, fill it with a mixture of sugar water (1 part sugar dissolved in 4 parts water) and you will be viewing the hummers right from your campsite. Dozens of these minuscule birds will congregate just after dawn and right before dark to feed, inserting their long beaks as they slurp the nectar with tiny forked tongues. An interesting fact about the black-chinned humming bird is that it makes it’s nest with spider webs. The webs stretch as the chicks grow. 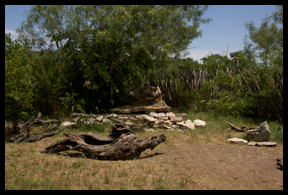 The Acorn Bird Blind on the east side of the camping loop is the location for ranger talks at the South Llano River State Park on summer weekend evenings. The bird blind adjacent to the walk-in camping area is named Falcon. Nearby is the Falcon trailhead. The South Llano River State Park is located approximated 6 miles outside the town of Junction, Texas in Texas Hill Country. Be sure to secure a camping reservation in advance before you head to the South Llano River State Park or any of the Texas Hill Country State Parks for a summer weekends. This entry was posted in State Parks, Texas, Texas Wildlife, Uncategorized and tagged bird blinds at the South Llano River State Park, bird watcher’s Central Texas, birding at the South Llano River State Park, hummingbirds at the South Llano River State Park, Texas native birds Painted Buntings. Bookmark the permalink. Thanks 4 sharing! those are so nice photos! It looks like you really have fun. Thanks for sharing all these photos.